With Congress focused on beefing up defense in the face of mounting threats from ISIS and other terrorists groups, domestic programs that have barely kept pace with inflation are taking a back seat again. Senate and House negotiators reached agreement Tuesday evening on a $1.1 trillion mega spending bill that will keep most of the federal government fully funded and operating for the remainder of the fiscal year. The deal averted the threat of another government shutdown and all but assured that Congress will wrap up its work for the year by the end of this week. Given the way lawmakers have carved up the available pot of funds, about 60 percent will go to the Pentagon and State Department for military operations and foreign assistance and aid, while roughly 40 percent will go for domestic programs. For the fifth year in a row, so-called non-defense discretionary spending vital to the economy and social fabric will either be frozen in place or slightly reduced, according to an analysis by the Center on Budget and Policy Priorities. Funding for programs ranging from law enforcement and veterans medical care to education, scientific research and housing assistance will flatline again due to budgetary cuts, spending caps and automatic across-the-board cuts authorized by Congress in recent years. 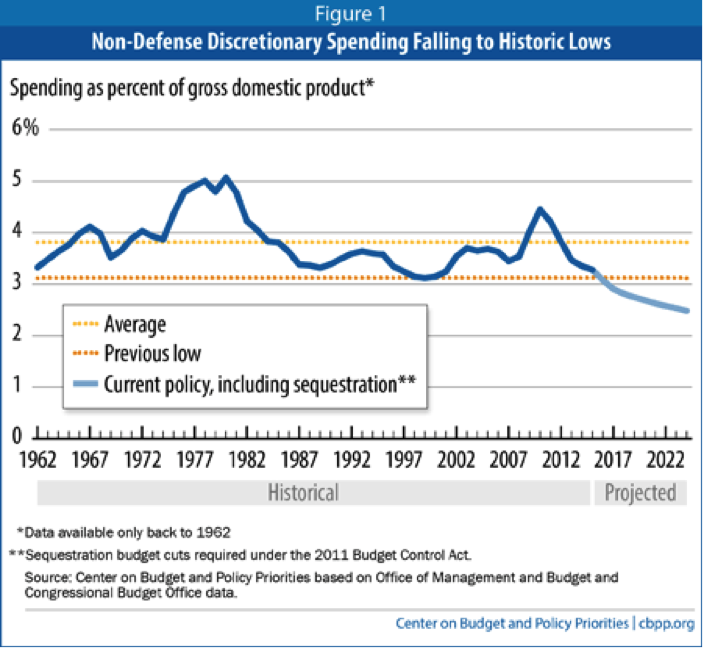 Non-defense discretionary spending dropped by $41 billion between 2010 and 2014 before adjusting for inflation, said the analysis. When inflation is factored in, the four-year cut was actually $87 billion or 15 percent. Under the terms of the final spending deal announced yesterday, many Americans may begin to feel a pinch in terms of diminished funding for Head Start, education, low-income fuel assistance, transportation subsidies, and job training, to name a few. The National Institutes of Health will receive new Ebola research funds for clinical trials, Politico reported earlier this week, but its core budget is likely to grow by only $150 million – not enough to keep pace with inflation. Moreover, as more federal grants and highway funding dry up, state and local governments will have far less to spend on health and educational programs and job-generating transportation projects. Others see it differently, saying that the relatively flat growth is a good sign Congress has finally gotten control of the budget after years of runaway spending. Sen. Jeff Sessions (R-AL), who is competing with Sen. Mike Enzi (R-WY) for the chairmanship of the Senate Budget Committee next year, forcefully opposed a bipartisan budget deal hammered out by House Budget Committee Chair Paul Ryan (R-WI) and Senate Budget Committee chair Patty Murray (D-WA) late last year. Sessions complained the agreement too easily adjusted levels of discretionary spending and balked at the inclusion of new federal fees, according to The Washington Post. Sessions insists policy makers “should grow the economy – not the government,” and that creating more jobs in an expanding economy should not necessitate adding to the debt. The U.S. is on a strong economic upturn after years of halting growth and persistent unemployment, but this has occurred in the face of stagnant government spending on infrastructure and domestic programs. Will plowing more money into defense provide the economy with the extra kick it needs, or is Congress being penny wise and pound foolish in not beefing up those programs when the deficit is at one of its lowest points in years? While Sessions and others blamed domestic spending for the government’s past deficit woes, that spending constitutes a relatively small and shrinking portion of the federal budget. This year, the overall federal budget totals roughly $3.9 trillion. The lion’s share – about 65 percent – will go for Social Security, Medicare and other entitlement programs. Just 29 percent will be allocated for defense and non-defense discretionary spending, while six percent will be dedicated to paying interest on the federal debt. Over the years, the rapid growth in mandatory spending for the elderly and the poor has crowded out discretionary spending. And budget deals and spending caps have further constricted discretionary spending. When defense is taken out of the equation, domestic discretionary spending represents only 17 percent of the national budget. The dramatic effect of this austerity, Reich says, is evident when measuring spending relative to gross domestic product (GDP) — the standard way to make budgetary comparisons over time. Spending for these programs stood at 3.4 percent of GDP in 2014, well below the 3.8 percent average over the five decades since 1962, he said. This trend will continue in 2015 and beyond under the 2011 Budget Control Act caps and sequestration. The Congressional Budget Office (CBO) estimates that non-defense spending will dip to 3.3 percent of GDP in 2015 and 3.1 percent in 2016 – which would equal its lowest level on record. “Put another way, the share of national income going to these programs — in education, science, infrastructure, environment, medical care for veterans, homeland security, and other fields — is rapidly approaching the lowest level, measured as a share of the economy, in at least five decades,” said Reich.